Here is some great information about Cattleya Orchid Plants, The Corsage Orchid. How popular are the Cattleya orchids plants? Are they grown by hobbyists or not? How big is the flower? Before we get into the answers for these and other questions let's look at a bit of history of the Cattleya. It is fascinating! Cattleya orchids have been named since the early 19th century. 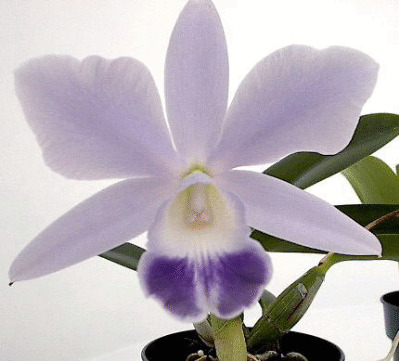 The earliest named Cattleya was the Cattleya labiata. Since then there has been a mystique about them. From the hobbyist perspective they are probably the most popular plant. They are also named corsage orchids because they are the common orchid used in corsages. The Cattleya orchid plants have one of the largest flowers, 5 inches across. They are harder to grow as most of them flower only once per year. And the flowers last only about 2 - 3 weeks. Although the hobbyists are the ones particularly taken with Cattleya plants now. They are becoming popular with non-hobbyist because of the size of the flower. These large flowers are exquisite and usually very fragrant. In fact, the fragrance can penetrate a whole room. For the Cattleya orchid plants to become a main-stay of orchids several things are happening today. The new hybrids are lasting longer and they are blooming more than once per year. It has been shown that the orchids now can be bred for more frequent blooming. This is important for the hobbyist who doesn't want the plant to be just leaves for 49 weeks a year. IF YOU ARE SERIOUS ABOUT LEARNING ABOUT ORCHIDS CHECK THIS E-BOOK OUT. Frequently people write me and ask me to recommend resources or sources of information to learn about orchids. Currently the one I am recommending first is Orchid Care Expert: A Practical Guide To Orchid Care by Nigel Howell. It is an excellent e-book. I own about 20 hard orchid books and over 5 orchid e-books. I like different books for different reasons. But this is the one I would suggest to start with right now whether you are a new orchid grower or have some experience. READ ON FOR MORE INFORMATION ON CATTLEYA ORCHID PLANTS. Cattleya orchids also will show the flower for more than 2-3 weeks and some of the hybrids have been shown to have flowers for up to 5 -6 weeks. Blooming more than once per year is important and actually has spawned another sub-industry. Some of the nurseries across the country will board your Cattleya between blooming seasons. Currently the orchid registry in England has not added many hybrids. Over the last 100+ years the numbers have been essentially stagnant. This means these orchid plants have been primarily in the hands of hobbyists and not the general public. Cattleya must be easier for folks to grow because most of us do not enjoy the benefits of a greenhouse. Indeed, Cattleya growers have been making some good progress in increasing the frequency and the length of time that the flowers stay in bloom. I feel it will be over the next 2 - 5 years you will see the popularity of these beautiful plants continue to increase. If you enjoy growing these orchids and want to learn more about other popular orchids check out these other popular orchids.